SpaceEngine handles all man-made objects in the catalog files named *.sc and they are located in directory data/catalogs/. This files are simple text documents, so you can edit them with notepad (or the better program Notepad++, which I recomend you to download and install). The directory data/catalogs/ have subdirectories named galaxies, clusters, nebulae, stars and planets, for each object type. Here I describe how to make a planetary system. Lets go to data/catalogs/planets/ folder and create there a new file named, MySystem.sc. Open it with notepad. First, you must choose a star, and which system you want to create. In current version of SE, it is impossible to create system for procedural stars. So you must choose one of the catalog stars, or create a new star (I will describe how to do it in a different thread). You can choose a star directly in SE. Start SE and disable procedural stars in F4 menu. When fly to Sun (press Shift-h, Shift-h and g) and start flying around to search for a star you want. If you want to create a system with habitable planets, note that for physical realism you can choose a yellow or red dwarf star (F5...F9, G0...G9, K0...K5), because only these stars have a long lifetime (billions of years) and have stable characteristics, so life has a lot of time to evolve on planets orbiting these stars. So, choose for example star named "ETA Cas" (Eta Cassiopeiae). This is a G0V sun-like star - A good choice! Note: Current version (0.95) gave a bug. Do not make planets for stars named 'HD XXXX' or 'HIP XXXX'. You can't make moons for them and have some other glitches. If you don't like it's appearance, change some parameters in your planet catalog script. Remember: you must restart SpaceEngine to see changes. Read descriptions of some parameters below. The functions of other parameters can be see above in comments of sample script. Note: if some parameters are missing, then they are initialized by default values. But some parameters are absolutely neccessary. Make sure that ParentBody contains the name of parent planet. 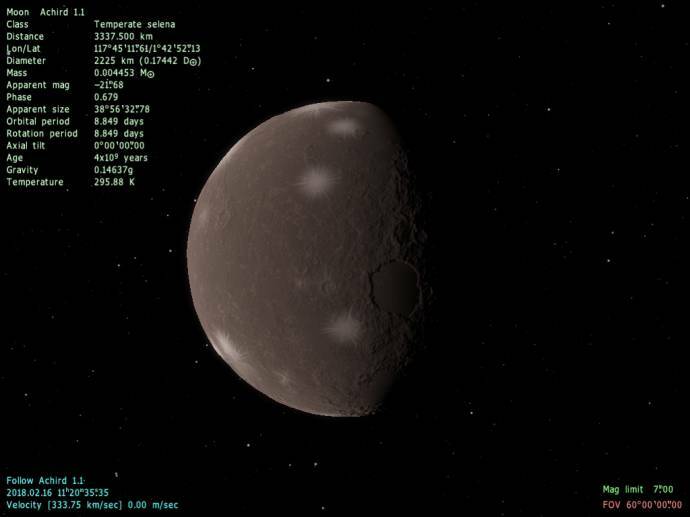 It is possible to make a moon orbiting the sun, but this is incorrect in the astronomical sense. Planet "Icarus/Eta Cas 3/Eta Cassiopeiae 3"
The Barycenter tag is a description of fictional "body" that must be the parent body for two stars of binary star system or two planets of binary planet. It can orbit another body (star or barycenter) itself. Use Barycenter tag to make hierarchical multiple stars and binary planets. But make sure you use correct orbits for two bodies orbiting barycenters (see below the Orbit tag description). 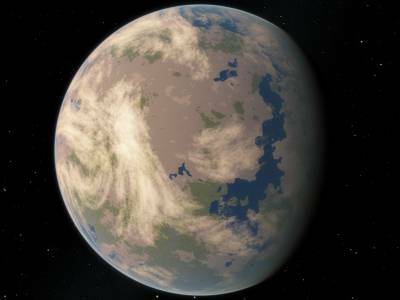 "Terra" - rocky planet with water on the surface (like Earth). "Desert" - rocky planet without water on the surface (like Venus or Mars). "Selena" - rocky planet without atmosphere (like Mercury, Moon, Io). "IceWorld" - icy planet with atmosphere (like Titan) or without atmosphere (like Europa, Ganymede, Callisto). "Asteroid" - asteroid-like body with incorrect shape. "GasGiant" or "Jovian" - gas giant planet (like Jupiter or Saturn). "IceGiant" or "Neptune" - ice giant planet (like Uranus or Neptune). BumpHeight - max height of landscape in km. BumpOffset - negative offset of landscape in km. For example, if you want to make landscape from -8 km to +12 km, type BumpHeight 20 and BumpOffset 8. DayAmbient - fake ambient lighting at daylight time. Usable for bodies without atmospheres and for cloud layers. Lommel - Lambert lighting model to Lommel-Seeliger lighting model ratio. Type Lommel 0.0 for Lambert only model (good for gas giants) or Lommel 1.0 for Lommel-Seeliger only model (good for dusty bodies without atmosphere, like Moon). Intermediate values for mixed lighting model (linear interpolation). Life - seed a life on a planet. If you type Life true, SpaceEngine will type "with life" string in planet's info table. Randomize - a randomization vector. If you make two identical planets (with all parameters identical), type different randomization values to make them look different. colorDistFreq, colorDistMagn - frequency and magnitude of "spots" of various detail textures. detailScale - scale of detail textures. colorConversion - convert colors of detail textures to colors of color table, defined by colorBeach ... colorUpPlants parameters (see below). snowLevel - relative height of snow level on mountains, obsolete parameter. tropicLatitude, icecapLatitude - sinus of latitude of tropics and polar ice cap endge (0.0 - equator, 1.0 - pole). icecapHeight - relative height of ice caps. climatePole, climateTropic, climateEquator - climate of poles, tropics and equator (it is an index to color table, 0.0 - desert, 0.5 - temperate zone, 1.0 - snow). mainFreq - frequency of main (global) noise, defines continents/oceans distribution. venusFreq, venusMagn - frequency and magnitude of Venus-like landscape forms. mareFreq, mareDensity - frequency and density (number) of impact bassins aka lunar mares. montesFreq, montesMagn, montesDensity - frequency and magnitude of mountains, density (number) of mountain massifs. hillsFreq, hillsMagn, hillsDensity - frequency and magnitude of mountains aka "eroded hills", density (number) of mountain massifs (works only on Desert and Terra). dunesFreq, dunesMagn, dunesDensity - frequency and magnitude of dunes, density (number) of dune massifs. canyonFreq, canyonMagn, canyonDensity - frequency and magnitude of canyons, density (number) of canyon massifs. cracksFreq, cracksMagn, cracksOctaves - frequency, magnitude and number of octaves of cracks in icy crust, like on Europa (works only on Selena and Ice World). craterFreq, craterMagn, craterDensity, craterOctaves - frequency, magnitude, density (number) and number of octaves of craters. craterRayedFactor - number of rayed craters relative to regular craters. cycloneFreq, cycloneMagn, cycloneDensity - frequency, magnitude and density (number) of cyclones in clouds layer. colorSea, colorShelf, colorBeach, colorDesert, colorLowland, colorUpland, colorRock, colorSnow - 8 vectors for color table from lower altitudes to higher altitudes. colorLowPlants and colorUpPlants - modification of colorLowland and colorUpland parameters for planets with life (Life true). This is water layer description. Planets may have several layers of water at different heights, but it is useful yet. The water is rendered as transparent spherical layer around the planet. Height - height of water surface above the lowest point of the planet's surface (Surface.Radius - Surface.BumpOffset) in kilometers. Make it lower than the highest mountains (Surface.BumpHeight) to obtain the seas and continents, and above them to get a planet completely covered by water. SpecularBright - bright of the solar spot glare, the default value is 20. SpecularPower - size of the solar spot glare, the default value of 150, the less the value - the larger the spot. DayAmbient - fake ambient lighting at daylight time. Color - modificator of the color of the water surface. Use the colorSea parameter from the Surface tag instead. Height - the height of the clouds above the lowest point of the planet's surface (Surface.Radius - Surface.BumpOffset) in kilometers. Make it is higher than the highest mountains (Surface.BumpHeight), so the clouds with no overlap with them. Velocity - velocity clouds at the equator relative to the planet's surface, in kilometers per second. Coverage - clouds coverage (0...1). Note that this is not coverage amount, but factor of converting heightmap to color map. twistZones and twistMagn - number of Jupiter-like zones or strips and its strength. To make a Venus-like cloud layer, type twistZones 1 and twistMagn 3.5. Earth.atm - Earth atmosphere model, blue sky and red sunset. Mars.atm - Mars atmosphere model, red sky and blue sunset. Venus.atm - Venus atmosphere model, yellow sky and blue sunset, big density. Jupiter.atm - Jupiter atmosphere model, white sky and yellow sunset. Neptune.atm - Neptune atmosphere model, deep blue sky and pink sunset. Titan.atm - Titan atmosphere model, violet-green-orange sky and red sunset. Sun.atm - Star atmosphere model, white sky and white sunset (real color is matched to star light color). Model - name of atmospheric model ("Earth", "Venus", etc). Height - height of the top boundary of the atmosphere in km. Typical value 50-100 km for terrestrial planets, 500-2000 km for gas giants. 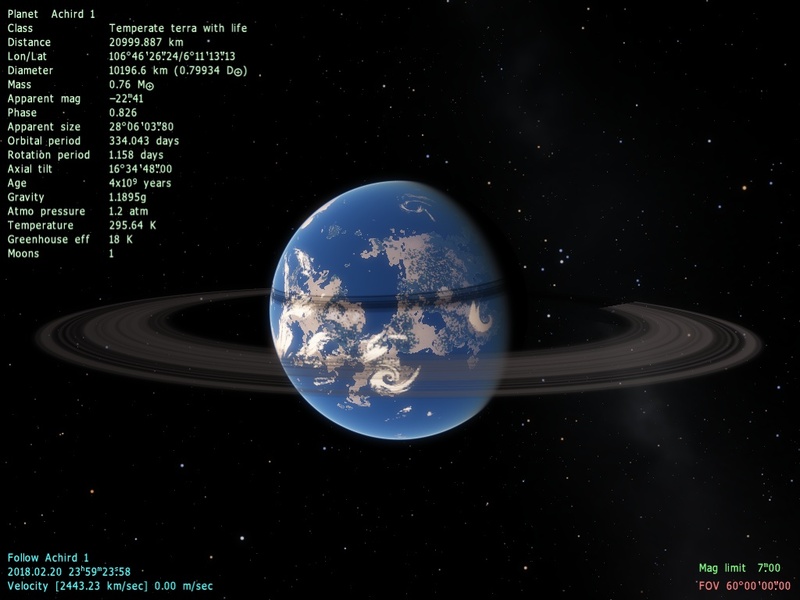 Pressure, Density, Greenhouse - physical parameters, some of them are typed by SpaceEngine in planet's info table. Greenhouse is a temperature of the greenhouse effect in Celsius or Kelvin degrees. Bright and Opacity - rendering parameters. To avoid visual artifacts, use Opacity = 0.1*Bright. This is the planetary rings system tag. In current version (0.95) rings are drawn as flat textured ring around planet with 4 levels of procedural noise. There is no way to control global noise pattern but to make a texture for it. Texture - the path to global texture. It must be in RGBA format and have dimentions of x*2 pixels, there x is the length of texture (512, 1024, etc). First row of pixels is a front-light radial color pattern (with opacity in alpha channel), and second row is a back-light radial color pattern (with opacity in alpha channel). Look at Saturn's rings in SpaceEngine: it has different appearance in back lighting, when Sun is behind Saturn. FrontBright - brightness of rings in front ("day") lighting. BackBright - brightness of rings in back ("night") lighting. Density - global opacity multiplier. Exposure - global brightness multiplier. This is the planetary orbit tag. Current version (0.95) uses only Kepler equations to compute orbital motions of bodies. If you do not know about Kepler orbital elements, refer to Wikipedia. Note: the Period parameter can be calculated automatically by SpaceEngine from the SemiMajorAxis or PericenterDist. Here are the sample codes for moon. Some parameters have no sense for this type of body, so those are skipped. 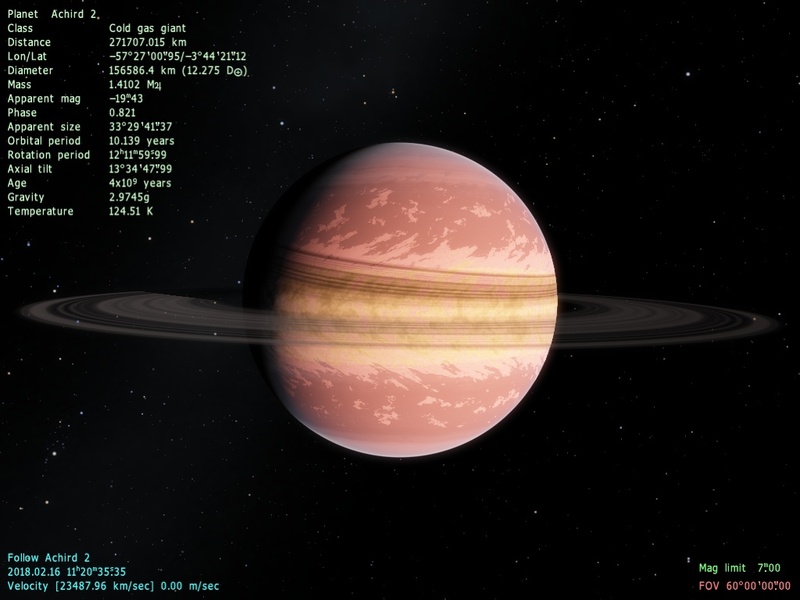 Here is the sample code for a gas giant. Some parameters have no sense for this type of body, so they have been skipped. Note that color table tags (colorSea ... colorSnow) here means colors of clouds at different altitudes, and is described in the Surface tag. You can download script for this tutorial here. Awesome and useful work. Thanks. Ask in this thread about the workings of parameters. This is like spore, only better! Planet "Reach/Epsilon Eri 2/18 Eri 2"
Thanks to your guide though I can make my own Catalogue. Right now I just have this pasted at the bottom of the "SolarSys.sc" file. This is a render from new version. SpaceEngineer, thank you for this thread, it is an invaluable resource! I was wondering if any changes to existing planet parameters, or new parameters, had been added for version 0.95. I am also curious how to specify 3D models since that is now an experimental feature? This tutorial will be updated soon. Version 0.95 has a lot of new parameters. The tutorial has been updated (v0.95). Press "Refresh page" in your browser to view updated images. Is there a way to change the tint of the atmosphere with the earth model, without making a new model? No. You only can control its brightness and opacity. Creating a new model is a bad idea, because atmosphere models are not deleted from video memory once being unnecessary (like planetary textures and stars).